At Eaglehawk Neck, the dogline proved highly effective. At Eaglehawk Neck there is a variety of attractions in close proximity of each other. Apart from the striking natural rock formations, there are historical sites such as the dogline and the Officers Quarters Museum. And of course there's Doo-Town. Have you heard of the dogline? This refers to a line of dogs that was once stationed at Eaglehawk Neck. The strip of land was only about a hundred metres wide at this point. The idea was to stop any convicts trying to escape through the area, coming from Port Arthur. The dogs would of course raise the alarm if anyone tried to get past. A couple of guards also kept watch with the dogs. At times there were as many as 18 dogs. 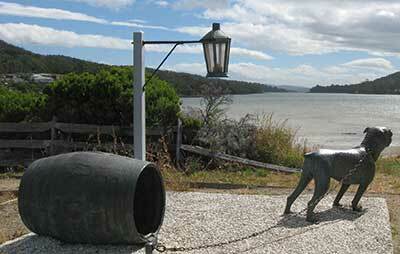 The dogline operated at Eaglehawk Neck for 45 years, from 1832 to 1877. It was highly effective as very few escapees ever got past. There was one time when someone tried to pass through on legitimate business. However he was held up for 36 hours until it was confirmed that he was not a convict trying to escape. 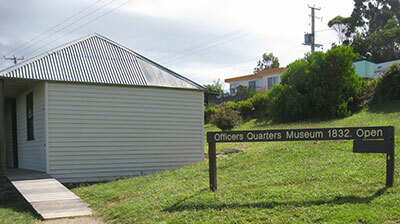 At the Officers Quarters Museum nearby, you venture from room to room learning about what life was like for former occupants, such as the military officers stationed here. In the last room, there is a delightful nine minute audio-visual display telling the amazing story of the convict, Martin Cash. Cash and his fellow escapees actually managed to get past the dogline at Eaglehawk Neck. The price they had to pay? They lost all their clothes in the water! 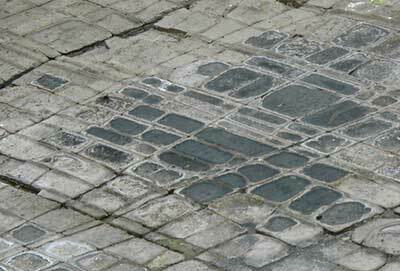 I was keen on seeing the Tessellated Pavement after watching a documentary on the Bimini Wall. Also known as the Bimini Road, this underwater rock formation can be found near the island of Bimini in the Bahamas. The lines on the rock pavement are so well ordered that it was once thought to be man-made. Some even speculated that this was part of the legendary island of Atlantis. 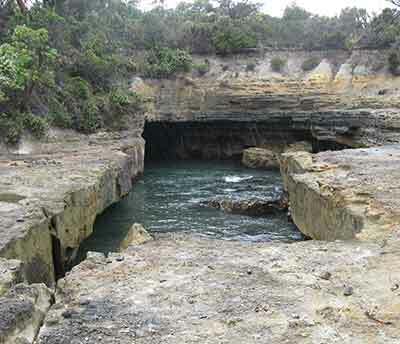 Eventually it was established that the Bimini Wall is actually a natural rock formation. It is believed to be similar to Tasmania's Tessellated Pavement which is visible above ground, so I had to see it for myself. Looking at it, I can certainly understand why some would wonder if it's man-made! Yet, this is the current end-product of natural processes that have been taking place over millions of years. The rest of the natural attractions at Eaglehawk Neck that I wanted to see were all very close to each other. After following the signs to the Tasman Arch, we parked in the car park and got out of the car. 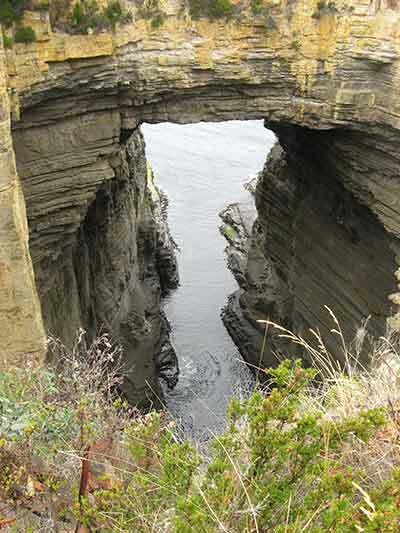 Isn't the Tasman Arch awesome? It looked like it had always been this way. But of course it hadn't. Again this was the result of land movements which had been going on over millions of years. As I read the information explaining how the Tasman Arch came to be what it is today, it blew my mind as I tried to imagine all the processes described. It has taken a very very long time for it to look the way it does today. Devil's Kitchen is also quite a spectacle. From the lookout point, it was difficult to see all the way down. Could that be why it's called Devil's Kitchen? Because it's far far down, as in where we think hell might be? I started thinking that it would be great to travel by boat to see these formations up close from the water. Unfortunately the Blowhole was not putting on a show that day. Well it was Australia Day so it might have been taking a break! I must admit I didn't wait around for very long as it was rather cold and windy at the time. Eventually the roof of the Blowhole will fall in, resulting in a gully. If sea levels rise, the Blowhole point will become two or three islands. So the Blowhole area as we know it today, is a work in progress. 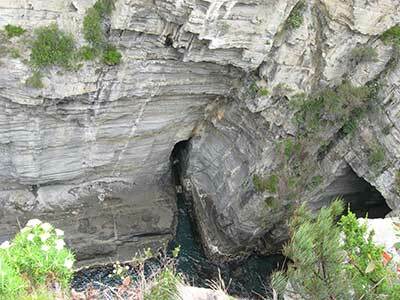 That gets me thinking that it will be pretty strange in time to come, visiting the area and wondering why it's called the "blowhole"! And now we come to Doo-Town. How did it get a name like that? Residents have chosen to include the word "Doo" in their house names. For example - Love Me Doo, Just Doo It, Dooing Time and many others. 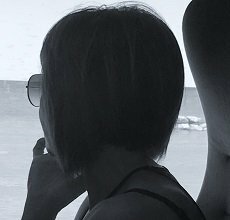 Which got me thinking - what would I name my Doo-Town home? How about Just Doo Tasmania?